The Alhambra, Granada, Spain, 1878, by Carl Curman, via Swedish National Heritage Board Commons on flickr. 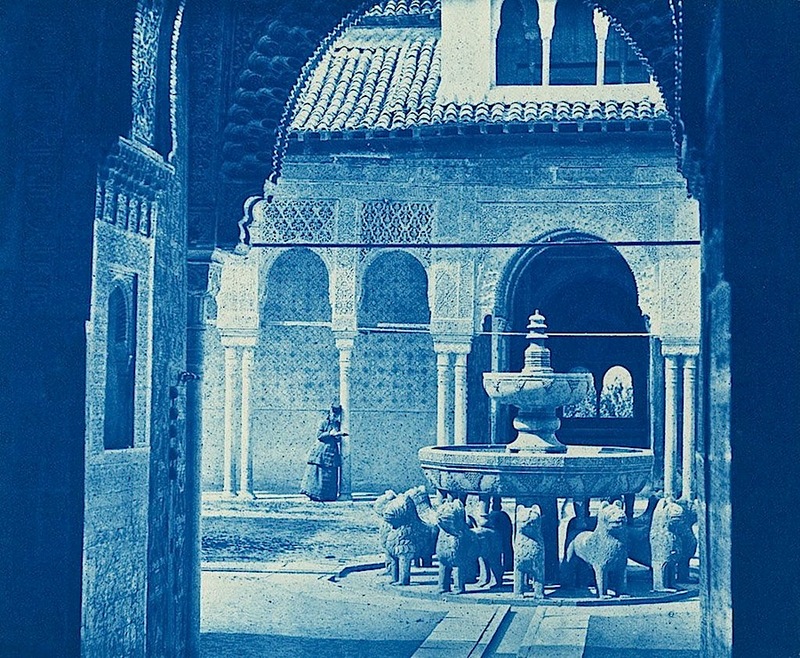 The cyanotype shows the photographer’s wife, Calla, either sketching or reading during a visit to the Court of the Lions. She was 28 at the time and just married to Curman. This may have been their honeymoon trip. The Alhambra fortress/palace was built primarily in the 13th and 14th centuries by the Muslim Nasrid dynasty of southern Spain. After the Christian Conquest in 1492, it became the royal residence of Ferdinand and Isabella and, later, their grandson, Charles V. However, by the 18th century the site was derelict and largely abandoned. 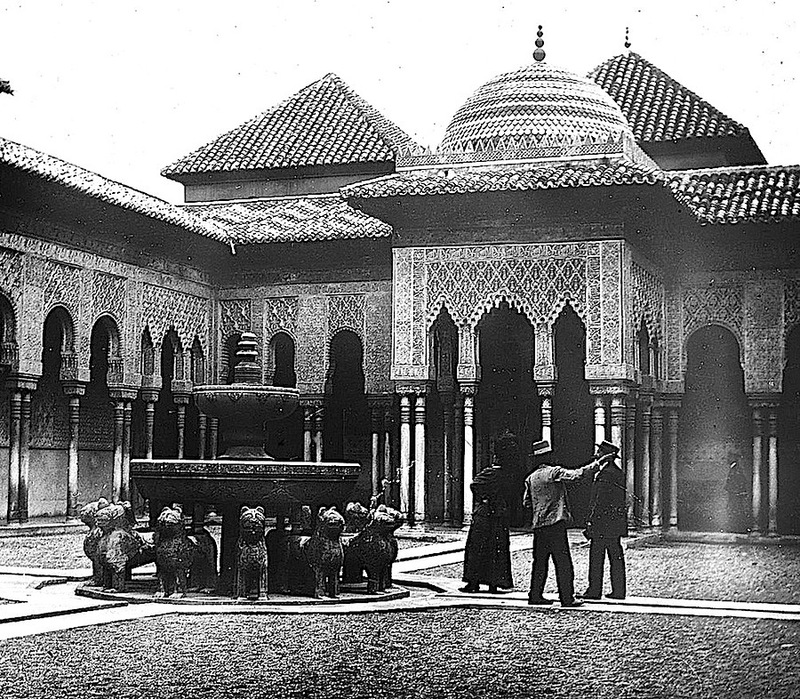 In 1829, the American writer Washington Irving stayed in the Alhambra for three months and then turned his impressions into the romantic Tales of the Alhambra. The book was popular, “the exotic was in vogue,” and cultured travelers — Calla was the daughter of a wealthy industrialist — began to visit the ruins in increasing numbers. Restoration work — often controversial — soon followed. Today, the old complex is a UNESCO World Heritage site. About 30 years after Carl and Calla’s trip, their son also visited the Court of the Lions and took the picture below. Group of tourists in the Court of the Lions, ca. 1910, by Sigurd Curman, via Tekniska museet (Stockholm) Commons on flickr. In the 14th century, the area around the fountain was a little lower than the walkways and planted in flowers, giving a tapestry or carpet effect. Today, as in the photo above, the space is entirely covered in dry pebbles to preserve the building’s foundation. I am the garden appearing every morning with adorned beauty; contemplate my beauty and you will be penetrated with understanding. — Ibn Zamrak, from a poem on the wall of the Hall of the Two Sisters in the Alhambra.